Carnevale in Italy, known in the US as carnival or mardi gras, takes place in the weeks leading up to Easter. Think of Carnevale in Italy as a big final party before Ash Wednesday, the restrictions of Lent and the more pious observances at Easter. Italy celebrates Carnevale with a huge winter festival marked by parades, masquerade balls, entertainment, music, and parties. Children throw confetti at each other, and sometimes flour and raw eggs! Mischief and pranks are common during Carnevale in Italy, hence the saying "a Carnevale ogni scherzo vale" (anything goes at Carnevale). Carnevale has roots in pagan festivals and traditions and, as is often the case with traditional festivals, it was adapted to fit into the Catholic rituals. Although Carnevale is actually one date, in Venice and elsewhere in Italy the celebrations and parties may begin a couple weeks before. Masks, maschere, are an important part of the Carnevale festival and are sold year-round at many shops in Venice, ranging from cheap versions to elaborate and expensive ones. People also wear elaborate costumes for the festival and there are costume or masquerade balls, both private and public. Italy has many Carnevale celebrations, but Venice, Viareggio, and Cento hold the biggest and most elaborate festivals. Many other Italian towns hold Carnevale festivals, some with very unusual events. In 2019, Carnevale will be on March 5. Consult this article for future dates for Carnevale in Italy. Venice's Carnevale season starts about two weeks before the actual date of Carnevale. Events and entertainment are held nightly throughout Venice, with people in costumes wandering around the city and reveling. Find out more in Tips for Going to Venice Carnevale. Most high-end hotels hold masked balls during Carnevale and may be able to provide rental costumes for visiting guests. Tickets may be expensive for these balls, and most require reservations. Venice's main Carnevale events are centered around Piazza San Marco, but events are held in every sestiere, or quarter, of Venice. There are gondola and boat parades along the Grand Canal, a mask parade in Piazza San Marco and a special Carnevale for Children event in the Cannaregio district. A fireworks show in Piazza San Marco, which can be seen all over Venice, marks the events' climax. Viareggio on the Tuscany coast has one of the biggest Carnevale celebrations in Italy. It's known for its giant, allegorical paper maiché floats used in parades, not only on Shrove Tuesday but also the three Sundays before and two weekends following. Floats are very often satirical and reflect current events and politics in Italy and elsewhere. The final parade is held on Saturday night and is followed by a huge fireworks show. Festivals, cultural events, concerts, and masked balls take place throughout the Carnevale season both in Viareggio and its surrounding areas, and restaurants have special Carnevale menus. The town of Ivrea, in the Piedmont region, has a unique carnival celebration with medieval roots. The carnival includes a colorful parade followed by orange-throwing battles in the center of town. The origins of the orange battle are murky, but local folklore cites the story of a young peasant girl named Violetta, who rebuffed the advances of a ruling tyrant in either the 12th or 13th century. She decapitated him and chaos ensued, with other villagers eventually burning the castle where he lived. During the present-day reenactment, one girl is chosen to play the role of Violetta, and dozens of aranceri (orange-throwers) representing both the tyrant and the peasants throw oranges at each other. The oranges are meant to represent stones and other ancient weapons. There's a big parade about a month before Carnevale officially begins. There are orange battles starting the Sunday before through the Tuesday of Carnevale. The culminating event is the burning of the scarli (big poles, erected in the middle of each district's square, covered with dry bushes) to end the carnival season. The island of Sardinia is steeped in tradition and that's especially true in the Barbagia villages outside Nuoro. Tradition is strongly reflected in their unique Carnevale festivals, influenced by ancient cult and rites. In the west coast town of Oristano, Carnevale is celebrated with a costumed parade, horse races and a re-enactment of a medieval jousting tournament in a festival called La Sartigilia. 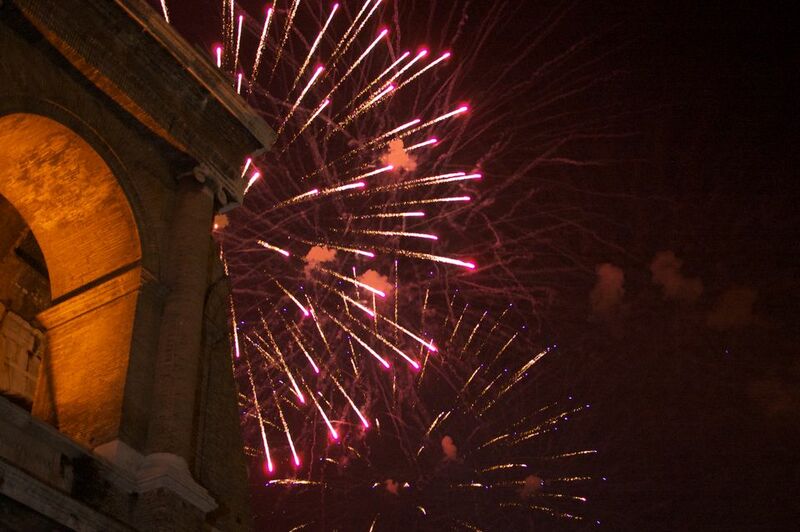 Acireale holds one of Sicily's most beautiful Carnevale celebrations. Flower and paper-mache allegorical floats, similar to the ones made in Acireale as far back as 1601, parade through the town's Baroque center. There are several parades during Carnevale, as well as music, a chess tournament, children's events and a fireworks finale. Pont St. Martin in the Val d'Aosta region of northwestern Italy celebrates Carnevale in Roman style with people dressed as nymphs and in togas. Sometimes there's even a chariot race. On Shrove Tuesday evening, festivities culminate with the hanging and burning of an effigy of the devil on the 2,000-year-old bridge. Cento, in the Emilia Romagna region, is linked to the most famous Carnivale celebration in the world, that of Rio de Janeiro, Brazil. Floats are very high quality and often include items from Brazil. The winning float in the Cento parade is actually taken to Brazil for their Carnaval festivities. Participants arrive from all over Italy to march in the parade or ride along on their motorcycles and some 30,000 pounds of candy are thrown to spectators along the parade route. Not far from Venice, Verona has one of the oldest Carnevale celebrations in Italy, dating back to 1615. On Shrove Tuesday, Verona has a huge parade with more than 500 floats. The Alpine resort town of Livigno, near the Swiss border, celebrates Carnevale with a procession of downhill skiers, followed by an obstacle race, a fancy dress ball and a traditional parade in the streets. In the southern Italian region of Calabria, which has Albanian settlements, Lungro holds a Carnevale parade with people in dressed in traditional Albanian costumes. The Carnevale of Pollino in Castrovillari includes women dressed in intricate local costume and celebrates the Pollino wine of the region, Lacrima di Castrovillari. In northern Calabria, Montalto Uffugo holds an interesting wedding parade of men wearing women's dresses. They hand out sweets and tastes of Pollino wine. Following the parade, the kings and queens arrive for a night of dancing wearing costumes that include giant heads. When Is Carnevale in Italy?